In case you missed my post earlier this week with the amazing news that I will be attending Comicpalooza this year let me tell you now how excited I am about this opportunity! I have always been a fan of all things considered to be “for the boys”. I was a tomboy growing up and not one of my “girlfriends” understood my fascination with super heroes, wrestling, sports, and being outside getting dirty. Even to this day you will not find me shopping for make up or playing dress up. You will find me looking at stats from games,at a sports bar having a beer, planning movie days with my family that involve all things Marvel, and seeing if I can add a new t-shirt to my growing collection. And now I get the chance to be with people who think the same way I do, that love the same things I do and I do not have to worry about feeling different! This may be one of the most amazing events that I ever get to do and the best part is, I get to share it with my family who LOVE this kind of stuff! This will be our first year at Comicpalooza and I have no idea what to expect! I know it will be loud and busy, but I also know that there is nothing like it and I will be making memories with my family that will we will never forget! As a matter of fact, I have not even TOLD my kids yet. Their reaction is sure to be priceless and I will be sure to share it with you guys! I can not even imagine how they will react to be honest or who they will be most excited to see and possibly meet. This mom is crossing all crossables for the opportunity to meet Jeremy Renner. Seriously. He is all my all time favorite Avenger and I totally think Hawkeye needs his own film! I should start a petition and get signatures for this. Although, if I met him I am not sure I could put one coherent sentence together in his presence. My husband has already said the one person he would want to meet is Stan Lee. I mean, who wouldn’t want to meet Stan Lee?! My 6 year old has an obsession with “Agent Carter” and is a big fan of the new TV Series so I am sure he would be over the moon to meet Hayley Atwell. I think if we had the opportunity to actually meet with her and ask her a few questions I would let him have control of the interview and ask her whatever his little heart desired. Could be interesting! Who would be your dream meet and greet at Comicpalooza this year?! You can see the guest line ups on their website. With a special discount code just for you guys, you could be at Comicpalooza with me! 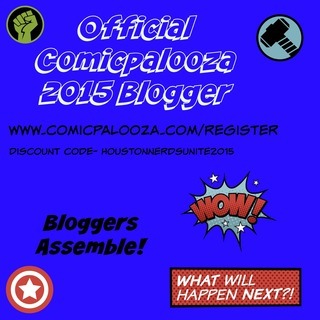 Head on over to the registration page and enter the code HoustonNerdsUnite2015. Now, if you want to wait and see if you can WIN some tickets from me…..NOW is your time!!! I have a family 4 pack of tickets to giveaway! Tickets are for ALL FOUR days at Comicpalooza! **Disclsoure: As an Official Comicpalooza blogger, I received tickets for my family to attend the event in exchange for social media shares. No monetary compensation was made and all opinions expressed are 100% my own. Oh my! So many on the list to meet. I would be honored to meet George Takei. I have been a fan since I was a young girl watching him on the Star Trek TV series. I would love to meet Stan Lee & my parents really want to meet Henry Winkler. I’d love to meet Jason Isaacs & Hayley Atwell! We would LOVE to meet Stan Lee! I would love to meet Jason Issacs! yea for giveaways! thanks for doing this!! I would love to meet Jason Isaacs! Potterhead for life. We would like to meet Laurie Holden. We are big fans of The Walking Dead. I want to meet Jason Isaacs! I would love to meet Henry Winkler!